As part of a reporting trip, the PBS NewsHour’s Joshua Barajas previously documented a hike through Arizona’s Sonoran Desert with the Tucson Samaritans, a group of volunteers who leave water and other aid for migrants crossing into the U.S. Here’s a closer look at what “migrant-handled” items were found on that hike. Two Tucson Samaritan volunteers remember the last time they came across a backpack in the Sonoran Desert. They found it in January, when many migrants succumb to hypothermia during the winter months. Inside the backpack were food packets, electrolyte water, a black piece of plastic to sleep on, two boxer shorts and a pair of jeans rolled up, among other items. The volunteers say the backpack was “crispy” from the cold. One of the volunteers, Ron Kovatch, says you could still smell the laundry detergent on the clothes. “It’s as though this person’s mother packed this bag,” he says. 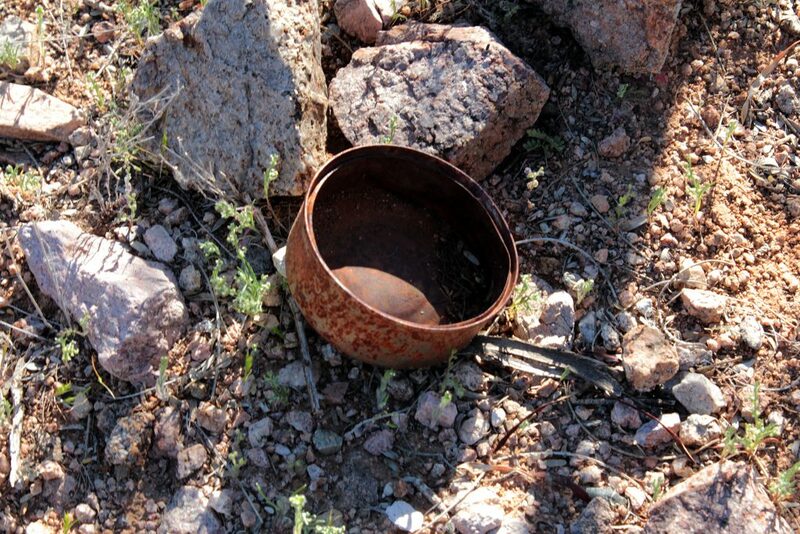 A lot of these personal effects are scattered throughout the Sonoran Desert, where thousands of undocumented immigrants have died making the journey up north from Mexico. In the desert, border crossers get hit by cars, drown, fall off cliffs and freeze to death, Alvaro Enciso says. He later tells me the story of one thirsty migrant, who climbed into a tall water tank but then couldn’t make his way back out. He drowned in the water that began to rise when the pump started. His body was found on Nov. 23, 2012. To remember the migrant, the Samaritans planted a cross near the tank. Enciso says not enough people understand the desperation of migrants wanting to reunite with their family or put food on the table. It “makes you do whatever you have to do,” he says. Black water bottle — Upon seeing the bottle, I thought it was a repurposed bleach bottle. It had a similar shape and size. Enciso tells me that these plastic bottles are made in Mexico, specifically with migrants in mind. The bottles are black because they don’t “shine at night,” he says. Tuna can — We saw a few cans on our hike, but there appeared to be more tuna cans in particular. Why? Enciso says tuna, even when cold, at least maintains some flavor, while beans do not. 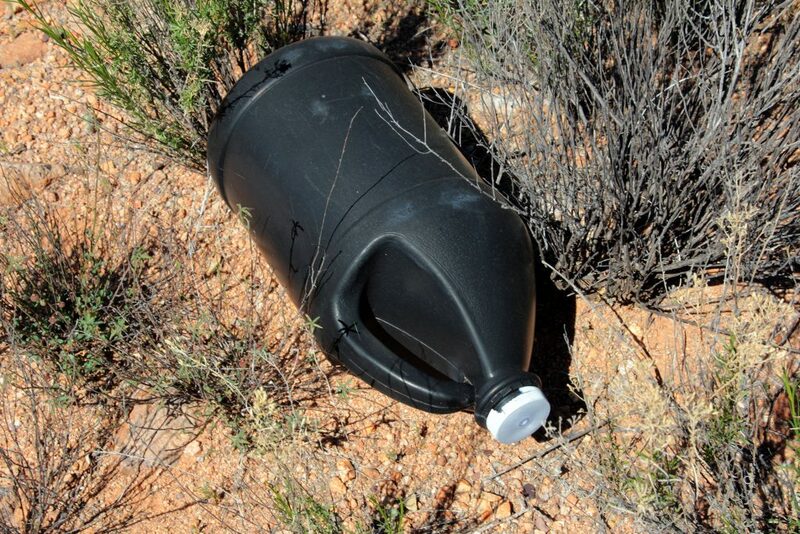 Black plastic — As mentioned above, black plastic can be used for sleeping or to guard against rain. While the Samaritans were making a grave marker for a fallen migrant at the approximate location where his remains were found, a small piece of black plastic was found nearby. Thinking it belonged to the unnamed individual, one volunteer secures the plastic at the base of the cross with a rock. Later that week, I drive to Nogales, Arizona, a little more than an hour drive from Tucson. The border fence cuts through downtown Nogales, separating the Arizona portion from Mexico. Houses and businesses run along the fence, and people can be seen talking to friends and family through its rusted steel beams. 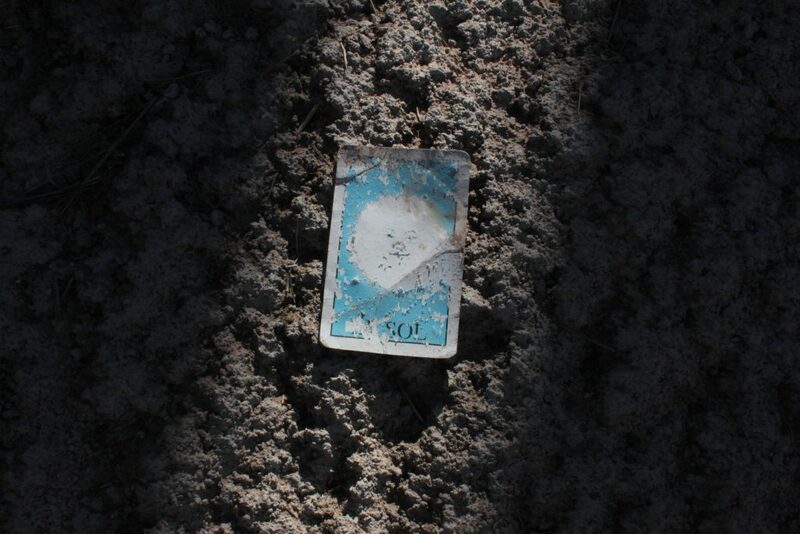 Along the fence, right outside the downtown area, I find a weathered Loteria card of “El Sol,” or the sun. The card is part of a Mexican card game I played with my grandparents as a child. I always associated El Sol with a particular saying: “La cobija de los pobres,” or “The roof of the poor,” in Spanish. It’s a saying meant to offer some comfort, a reminder that there’s shelter for you, even in dire situations. 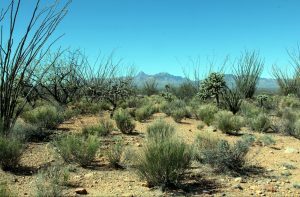 The Sonoran Desert, however, provides little opportunity for shade. With a port of entry nearby in Nogales, Border Patrol agents are a constant presence — in SUVs, on bikes and on foot. Amid all the boutique department stores, vintage signage and tchotchke vendors, there’s a big store dedicated to tactical gear, no doubt a stop for local law enforcement. Beyond building up the border wall, President Donald Trump has also indicated he will boost border patrol forces. “Somebody has to arrest the people who are going to continue to attempt to enter even if there is a border wall,” the new U.S. Border Patrol Chief, Ron Vitiello, told reporters at his swearing-in ceremony earlier this month. It’s a prospect that didn’t sit well with immigrant rights advocates I spoke with. 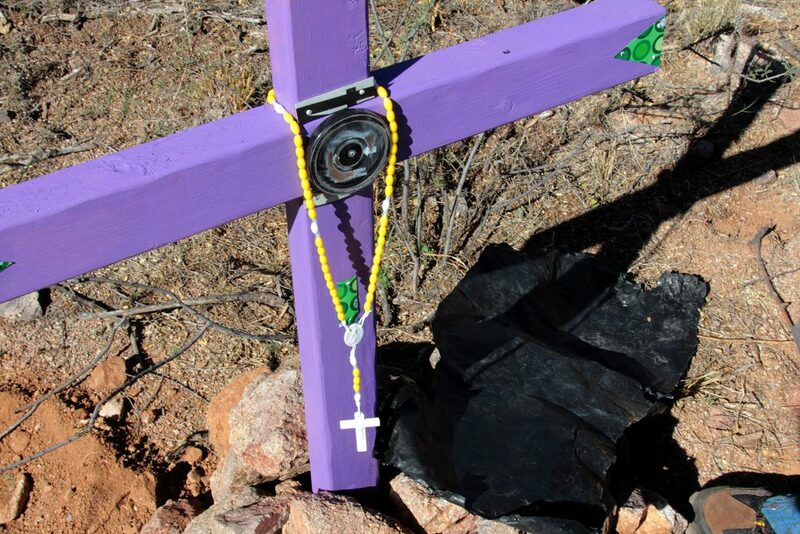 Groups like No More Deaths in southern Arizona have condemned the Border Patrol, saying the agency’s strategy has used the desert against border crossers who risk more perilous terrain to avoid detection. On the hottest days, migrants face dehydration, hyperthermia, among other dangers, in a desert with little shade. The agency has previously pushed back on those claims, saying smugglers, taking advantage of migrants, are responsible for their deaths in the desert. “The smugglers are the ones that put immigrants in dangers. 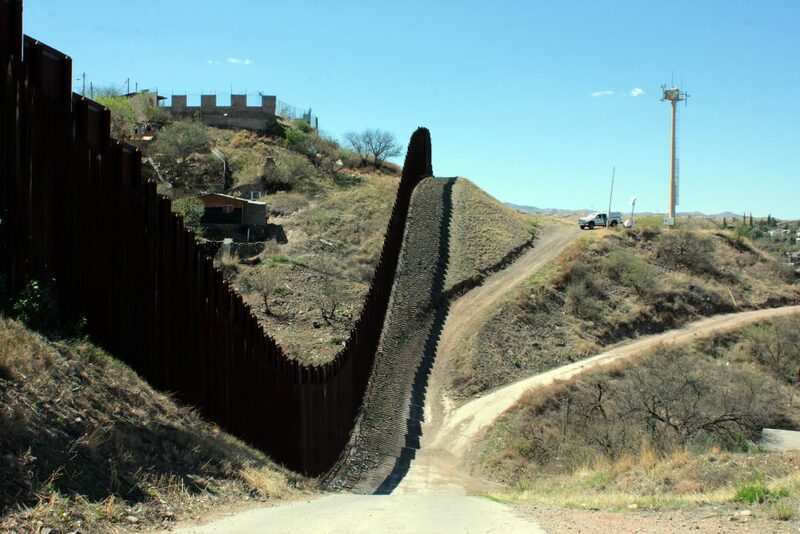 They’re the ones that force them to walk in the desert with limited water, limited food supplies and things like that,” Border Patrol spokesman Vicente Paco told the NewsHour. “They’re whole purpose is to get monetary gain off of this. They don’t see a human life, they see a dollar sign,” he said.